at least not that I remember. inexpensive, a black onyx with a diamond chip. Such children, an onyx ring. and shorthand, the Gregg method. her way of keeping her secrets. She taught me to write my name that way. I looked for it in her writings. I only play in the key of C she would say. but she sent me to Peabody. I can play in any key, yet don’t have her touch, her spirit. diamonds still on her fingers. to keep them safe, they said. Don’t grieve when I go, she said. I’ve had a wonderful life. Gardens surrounded the house where I grew up. I didn’t appreciate them then, took them for granted. But, in these fine spring days, I find myself drawn back. Such beauty in my midst, and I unaware. So, these memories – I wonder how accurate they are. And then wonder if it matters. These filled an area in the lower gardens. A rickety bridge, then a field of green with small white blossoms. I wasn’t allowed to cross, to tread on these delicate plants. We all watched, from afar. A wooden pergola covered the entrance to our back door, weighed down with aged wisteria. Each year the arbor sagged a bit more under its bulk. One morning, as we opened the door, we found that the wisteria had won out. It, and the trellis, lay on the ground. Though the plant roots remained, it seemed that the plant never recovered from the loss of its structure, and that year was the year that it bloomed its last. My grandmother’s house was in back of ours, she of the green thumb. Everything she touched thrived, unlike my mother, and me. 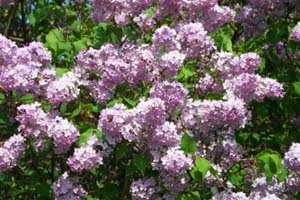 Lilac trees, white and purple, lined one side of her house. I remember taking bouquets of lilacs, wrapped in waxed paper and tin foil (as we called it then) to my teachers, their desks replete with a bounty of roses and spring flowers from eager students – or eager parents. I happily happened on a Facebook post about snowball bushes. How wonderful that someone else remembered, these now so out of favor that they are confused with hydrangeas. They lined a hill on one side of our house, white, heavy with blossoms that lasted only one day in a vase, meant to be where they thrived, in their own environment, not for us humans to conquer. A bed of peonies that greeted us as we rounded the driveway, not only with their color, but with their scent. Again, too brief a season, giving us a reason to stop, to pay attention. For so much of what we love is fragile, lasting what seems only a day.